McGuire’s Trailers is a family run business. While Denny built all of his own livestock vans and trailers throughout the sixties, he didn’t start welding for a living until he opened McGuire’s Trailers in 1971. At this time, his son Del started helping after school and during the summers. Denny’s wife Doris was doing the books and chasing parts. In 1991, we started selling other brands of trailers besides our own. We don’t build trailers from the ground up anymore, but we still have all the tools to do it. So in having all these tools and experience, we can repair almost anything . 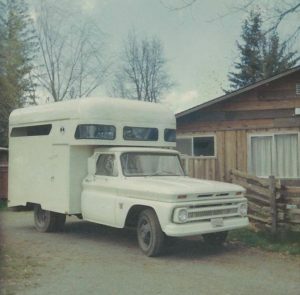 This truck with a horse van is one that Del’s dad, Denny, made in the mid-1960s. This truck/trailer set up was popular at the time and the McGuires made several of them up until the late-1970s.